Suppose we are running an apple stand located along a busy highway in a popular tourist trap. To keep track of how many apples we have at any given moment in our apple stand, we have computerized the process with a script that records the number of apples stocked and sold. 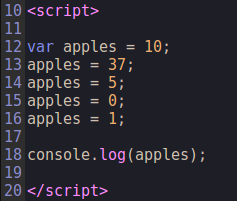 This script needs a way to store how many apples are present in the inventory, so we use a variable named apples that stores the number of apples currently in the apple stand. As tourists purchase apples, the value of the variable decreases with a new value, and as the fruit truck arrives and replenishes the stand’s apple supply, the value of the variable increases. Either way, the number of apples recorded in the apples variable is changing. var is the keyword, and apples is the identifier. By default, variables are undefined and have no value. We can test this by running this script to see a variable’s content in the Browser’s console output (Shift + Ctrl + I in the Vivaldi browser). A variable without a value returns undefined. We see that the console.log() output in line 13 has an undefined state. Defining assigns a value to a variable, and we use the assignment operator, represented by the equals character (=), to store a value in the variable. Note that the variable must first exist before we can assign anything to it. We can place the declaration and definition in a single statement. Both techniques work, so which to use depends upon the needs of the script. Now, if we run the script, we will see the value of apples in the console output. 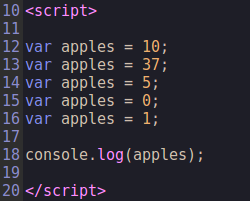 Console shows 100 apples in the apples stand. We only declare a variable once. After that, we can use its identifier (name) to access the variable. Redeclaring the same variable repeatedly. Much better. Declare once, use again. Same result, but apples is declared once. Simply use the identifier to store new values in the variable. Suppose apples does not exist when we assign the value 8 to it. Even though the script works without var, using the var keyword is good practice. We cannot name a variable anything we want. There are rules to follow that prevent syntax errors and ambiguities. 1. Identifiers are case-sensitive. apples and Apples are two different identifiers. 2. The identifier must begin with a letter, the dollar sign ($), or the underscore (_). It cannot begin with a number. 3. The identifier may contain any combination of letters, numbers, dollar signs ($), and underscores (_). Do not use spaces, hyphens (-), or periods (.). var var = 3; // No, no. Suppose you want to have multiple words in an identifier. Spaces are not allowed, so is this possible? The combination of lower and uppercase resembles humps on a camel’s back. If you dislike the “humpy” capitalization, underscores will achieve the same result. Use whichever method you prefer, but be consistent throughout your script for readability. Remember, spaces are not allowed in an identifier because whitespace denotes its end. Note: Avoid capitalizing identifiers. A capitalized identifier usually denotes a class in other programming languages. Use apples, not Apples for a variable’s identifier. 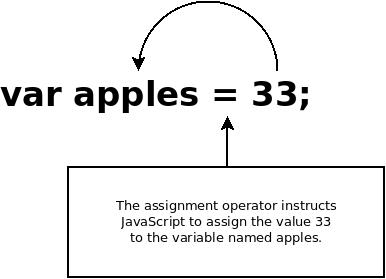 The equals character (=) is called the assignment operator. It says, “Take whatever value is on the right of the = character and store it in the variable.” It does not mean that two expressions are equal in value. The assignment operator used in variable assignment is right-associative, meaning the flow is from right to left. Numeric: Any signed or unsigned number with or without a decimal point. Boolean: true or false values. Other data types exist. For example, undefined is also a data type, and it is the data type returned for a variable that does not yet contain an assigned value. Other languages, such as C and Java, are strongly typed. Strong typing means that you must specify the exact type of data that a variable will hold when the variable is declared, and the variable can hold only that type and no other. Any attempt to assign a different data type to a variable will result in an error. For example, in Java, suppose we declare an integer variable that holds the value 100. Let’s assign a different value to the number variable. So far, so good. This is because the variable number holds integers, and 100 and 200 are both integers. But suppose we try to assign a floating-point value (a number containing a decimal point) to the number variable. This will not work, and Java will complain and refuse to compile. The variable number cannot store a floating-point value because it was declared as an integer variable. In fact, we can even assign a string to the number variable. What good is Boolean? Why not use 0 and 1 instead? Programming constructs often require a variable that holds one of only two possible states. Boolean is named after the English mathematician, George Boole, who formalized the laws of Boolean algebra around 1854. A Boolean data type holds a true or false value named…wait for it…true or false. Yes, these are keywords, so you cannot name an identifier true or false. A light switch with two states, On or Off, is an example of a Boolean data type. true and false are case-sensitive with lowercase true and lowercase false. Do not use True or False since these will return errors. We can declare more than one variable in a single statement using one var keyword. Both are equally valid. A comma separates each identifier, and assignments are also allowed. Which method you use best depends upon which facilitates readability. Whatever string is passed to the confirm() method will be displayed in the popup to give instructions to the user. The user must click on either the OK button or the Cancel button, and a Boolean value will be returned depending upon which button was clicked. The return value is stored in the variable choice, which is displayed in the console. This entry was posted on November 7, 2017, 6:45 PM and is filed under Lessons. You can follow any responses to this entry through RSS 2.0. You can leave a response, or trackback from your own site.